Linder Sterling is a true hero of mine. Her montage work is inspirational and of course influences my little collages (I’m too much in awe to ever use her famously bold red lips as comparisons would be a little too obvious.) The artist herself best describes her beginnings on this video for the TATE. Owning an actual piece of Linder’s still eludes me. I’d adore any of her designs with Nicoll (see my Net-a-Porter Chrimbo list!) but would obviously covet more a piece of her art. Linder continues to push the boundaries, again with Richard Nicoll, in their recent work for the House of Voltaire. Look closely here, yet with caution, at how boundaries are still being pushed 4 decades on. So here endeth a post filled with utter adoration and appreciation. 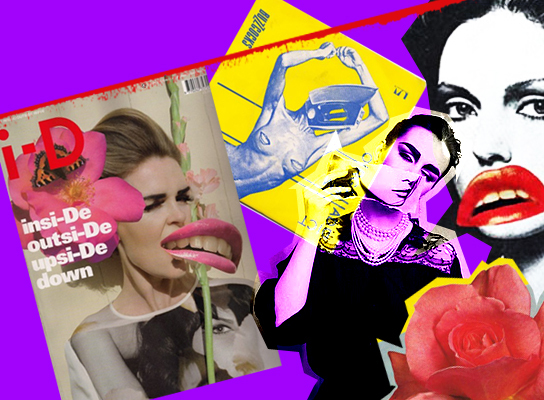 The day a piece of Linder Sterling’s work enters my humble abode, expect an even more gushing rant of excitement! This Christmas, while eating with my parents on Christmas Eve, the conversation turned to fur. I asked my mother about a little fur jacket she used to dress me in as a toddler. It turned out it was still in my wardrobe, in my childhood bedroom that hasn’t change since I left home in 1996 (aside from the removal of some suspect posters.) So I went to get the aforementioned mini-fur. It still fitted, all be it in cape form and my Mum then reminded me of her adult version. It was found, put on and crudely modelled by me. It was the first time I have worn a real fur, or at least remember wearing a real fur (the mini-version was worn in my memory-less time of infancy.) It was heavy and incredibly warm. In one “try on” the functionality of fur was immediately apparent to me; I could see exactly why so many Parisians donned their furs during the -10C temperatures we experienced there in December. My Mum said I should keep it, all at the party agreed. I however could not. It was coney fur and the amount of pelts (i.e. rabbit skins) that must have gone into the floor-length piece could have numbered 25 plus. To my inexperienced touch, it felt like one of my beautiful cats. It shed little hairs, like one of my cats. It had an animal smell, like one of my cats. That for me was enough reason not to keep it. My Aunt then brought up a point that I have read about but have never experienced directly. This was a “vintage” fur. These animals were already dead, they would never live again, this coat would otherwise just remain in the wardrobe. I hear so many people say they will only wear vintage fur, for the very reasons my Aunt cited. There the argument falls down for me. In fashion, we are often driven by a covetous desire to replicate someone else’s style, or at least part of it. If that is fur, we will seek and buy fur. 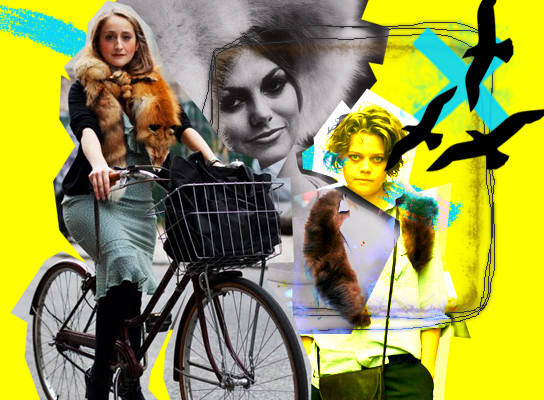 If designers see a trend for fur, be it vintage i.e. dead for a long time, they will be tempted to use fur in their collections i.e. dead for slightly less time! Fur for functionality, I can comprehend. If I lived in sub-zero Siberian temperatures, a fur would have a very practical purpose but here in the U.K., I don’t feel temperatures merit it. To be honest, all the people I know that own a fur wouldn’t dream of wearing it in the U.K. snow, for fear of damage. Fur for fashion, is not my thing at all, be it vintage or otherwise, it’s still a dead animal. * Thank you to the Sartorialist for the images. My post is not a criticism of his gorgeous photography, just a comment on my personal style. I must also direct you to this very insightful (as always) article by Colin McDowell about the use of fur in fashion. The sales figures he quotes are astounding! Garance = an illustrator extraordinaire and an accidental, unassuming part of the bloggersphere’s most powerful “it” couple. Garance inspires me to blog better. This post isn’t really about the person but the work, specifically Garance’s collaboration with Gap 1969; a celebration of 40 years of the denim giant. I waited patiently for her t-shirts to appear on Colette’s e-shop this weekend and snapped up one immediately, despite it possibly not being my size. I then paused after my impetuous click/purchase – had I been drawn into the hype or was I genuinely enamoured with Garance’s work. I thought of the other designer collaborations that have caused such frenetic hype. The most obvious and recent has to be that of Christopher Kane for Topshop. There were some fantastic pieces but one dominated, the crocodile dress and t-shirt (Street Peeper’s montage, although humorous, made me CRINGE!) The concept is admirable, affordable designer fashion but when it becomes so ubiquitous, doesn’t it lose that unique element that makes it stylish? Kate Moss’ Topshop collections can’t go unmentioned; they photograph well but lack a sense of quality or originality in person. One of the collabs I remember the most was Viktor & Rolf‘s for H&M. I scoured eBay for one of their heart pocket trenches, only to suddenly realise, as I contemplated handing over £200 that the only feature I lusted after was the heart-shaped appliqué. 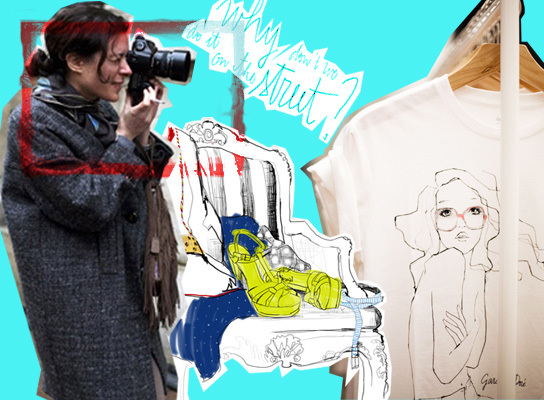 So back to my original question, have I been blinded by my fanaticism for Garance into buying one of her t-shirts? The conclusion I have reached is a definite NO. How can I answer so defiantly? I just realised I have NEVER bought any design collaboration pieces before, not one and I must return to my original point; this is not about the person, it’s about the work. Je vais essayer d’écrire mon blog plus en français – si Garance peut le faire (même avec l’aide d’un traducteur) je peux le faire aussi. Another new post, another new picture size…still testing the waters! This post is all about the ubiquitous Jackie Dixon. You may not realise how often you see her work. 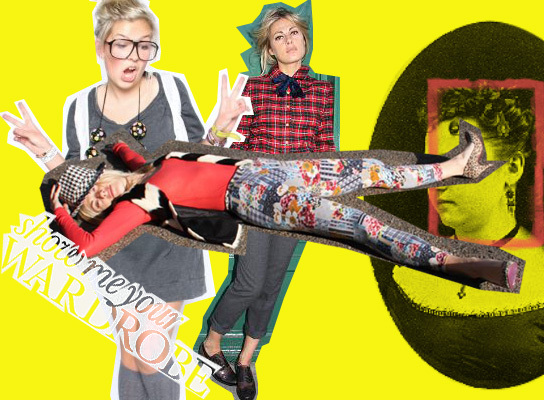 Her blog, Show Me Your Wardrobe, morphed into Topshop‘s brilliant, Show Me Your Topshop (above left (vertical!)) for London Fashion Week. She pops up in all number of magazines, my favourite recent collaboration being with the Sunday Times’ Style’s Senior Fashion Ed, Natalie Hartley (pictured above both horizontally and vertically!) It may just be the voyeuse in me that adores everything that Jackie does. It’s amazing to get a glimpse into the closets of the stylish and see that they really do have 3 identical blazers like me, in 3 different colours; hardly a necessity! The Times’ Style feature has a unique quality, one that draws you in and makes you believe you HAVE to have that item, you simply CAN’T live without it, hence shaping my afternoon – the search for the perfect boy brogue on eBay! My blog thus far has been “anonyme” in the French sense. Above is the one and possibly ONLY image of me that the blog will ever reveal. The reason behind this apparent change of heart…Rankin. What started as a jovial tweet from my mate Juan, followed by a few emails, resulted in the above shot (I’m on the left by the way!) I would like to make one thing clear, this is not the normal me; this is the enhanced me, lit by death lamp and shot by a genius. The process itself was phenomenal. I toyed with the idea of puling out all week, as I have never been comfortable in front of the camera. The Old Truman Brewery in Brick Lane housed Rankin’s makeshift studio and stunning exhibition and once in, there was no escape. Hair and make-up was a treat, laid-back and WAY more fun than expected (I am possibly the only person in the world that pre-imagined that this would be torture!) I was first up, thank goodness, as if I’d seen another be “Ranked” my nerves would have increased ten-fold. Rankin breezed in, cool and calm with his team at his side and a suitably bold soundtrack to match. One element I really wasn’t expecting was the interactivity of the exhibition – there was an open gallery, I was being watched, there was a film crew! By now I was in robot-adrenalin mode, so just got on with it. I was about as natural as polyester in front of the lens but I learned a lot; for instance, I angle my head each time I smile, my cheese-monger grin produces more wrinkles than an Olympus can handle and blonde facial hair shows up like a rug under the death lamp! The main lesson I learned as an amateur faced with a camera, was that with the aid of an astounding photographer, extreme lighting and Photoshop, we can all, even mere mortals, be transformed. As I get to grips with my Diana F+ camera, my admiration for professional photographers increases. Stories of the Eye is basically a perfect modern ad campaign for Olympus. Take 4 fashionistas, give them an Olympus camera and get them to photoblog the results. Alice Dellal, Daisy Lowe, Miquita Oliver and Lovefoxx of CSS, showcase their personal snaps in association with the aforementioned brand. Their combined cool factor alone is enough to make me nose through the shots and the collaboration with Olympus does lead me to question my next camera choice. I am enamoured with the Leica C-Lux 3 but do I love it for its look, or for its picture quality? Peruse the lovely ladies’ Olympus rolls here and maybe summon up the courage to submit your own photographic offering too. Feel free to tell me what camera you use and what you think of my “aesthetic” choice! Hedi Slimane’s fashion crudentials are enviable; from Yves Saint Laurent to Dior, his influence has shaped the look of menswear today. He is called, “friend” by many notorious celebrities and has delved deep into the the world of art. It is his photography that has drawn me in – it is contemporary, relevant and very real. He has that covetable talent of making the ordinary, extraordinary – taking everyday objects and events and making them exceptional. His blog/diary is inspirational and worth a perusal to gain a true insight into the life and influences of the artist. In the digital age we are all amateur photographers, sometimes too intent on capturing the moment, rather than truly experiencing it. Mr. Things of Random Coolness and I often snap away together but find the resulting photographs can represent the same event in a different light. The photographer can discover, pick out so much detail and in the days of airbrushing and touch-ups, I often wonder what I am truly seeing. A photograph by Mario Testino never feels that way. The relationship formed with his subjects seems genuine, allowing a true insight into their character. No more so is this evident than in his photographs of Kate Moss – for me it’s all in the eyes; she seems so at ease, so natural, offering us a true glimpse of her real self. The most interesting element of the photographs I have chosen above is disguise. Kate is hidden behind a mask, behind thick, haphazard face-paints…yet for me, these pictures provide a sincere and natural portrait. Mario Testino’s website is currently under construction but you can sign up to his newsletter here. Seeing people in their own space, their natural habitat, offers an unadulterated insight into who they really are. The Selby offers a photographic platter of images that represent people in their true light, in their comfort zone. Visually the site is stunning; then click on the main image to discover a little more. What quirky ornaments lurk on their shelves, what pieces of art do they hold dear? See Alexander Wang in his atelier, see cutting edge designers and artists relaxing at home. The part I love about The Selby is that is humanises people that are often separated from the average person and although it is extremely voyeristic, with the permission of the subjects, it really doesn’t seem so. Spend a few minutes (or, more likely hours!) clicking…to reveal just a little more.